A hearty instant pot lentil soup with bacon and veggies. A pressure cooker lentil soup chock full of nutrition and tons of flavor. A must-have in your recipe book! I’m all about the soups since it got colder and I love them all, this lentil soup though is special! It is incredibly flavorful! It gives you kisses from the inside of your belly! A hug disguised in soup when you’re cold to the bones. Ha! Enough of the poetry, let’s get right into it, shall we? Well, that all depends on what kind of Lentil Soup you want to make. A creamy one or a chunky one. For a creamy lentil soup, you’re going to want to use only red lentils. For a chunky one like this soup, a mix is the best way to go. My favorite lentils are green lentils BY FAR! I mix them with red for this recipe and on top add some cannellini beans. The red lentils and the cannellini beans make the soup creamy and the green lentils keep their shape a bit better for that chunky texture. 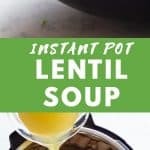 Should I Soak Lentils if Cooked in the Instant Pot? Long answer: it’s an everlasting debate and everybody has a different opinion * sigh *. The people in the “no-soak” camp say it’s not “necessary”. The beans cook through without soaking and taste exactly the same and you save one step in the process of preparing them. It’s not about the cooking time OR the taste though in my opinion. It’s all about digestion. Unsoaked legumes (ANY legumes) are way harder to digest and the consequences are “windy”, lol. I prefer to soak all my legumes because then I can enjoy eating laaarge amounts of lentil soup without feeling all bloated. Lentils are 100 times easier to digest when soaked for 12-18 hours. Just make sure you rinse them well under running water once finished soaking. Same applies to my super simple Lentils and Rice Recipe. 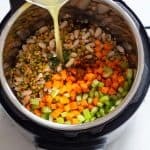 Can Instant Pot Lentil Soup be frozen? YES!!! It’s perrrfect for freezing! You can make a double batch and freeze in either individual portions, or if you want it for one of those busy weekdays as family dinner I’ve got a trick for you. 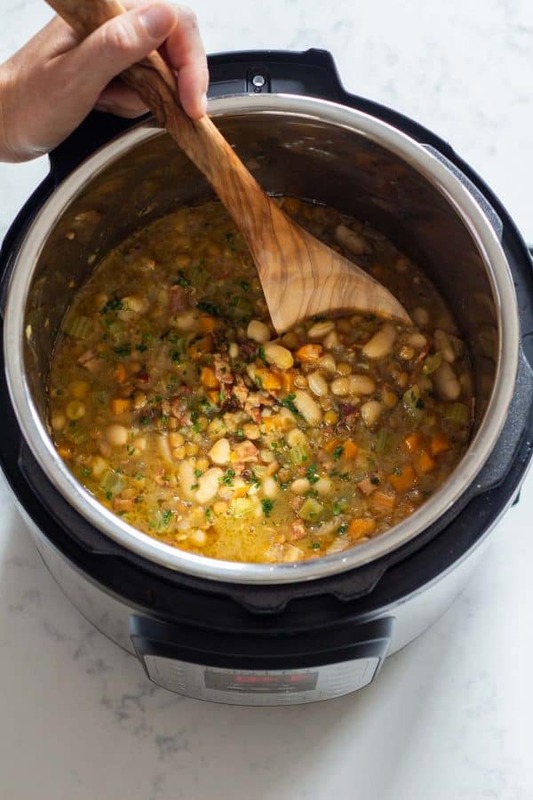 Add the soup to a large freezer bag and into the instant pot’s stainless steel pot and pop in the freezer. Once frozen (a couple hours), remove the freezer bag from the pot and put the pot back in your instant pot and the freezer bag back into the freezer. You just froze your soup in the perfect share to add back in the instant pot on the day you want to make it. You just run a little warm water over the bag so you can dump the round block of soup into your instant pot, set it to 5 minutes high pressure and it’s done! 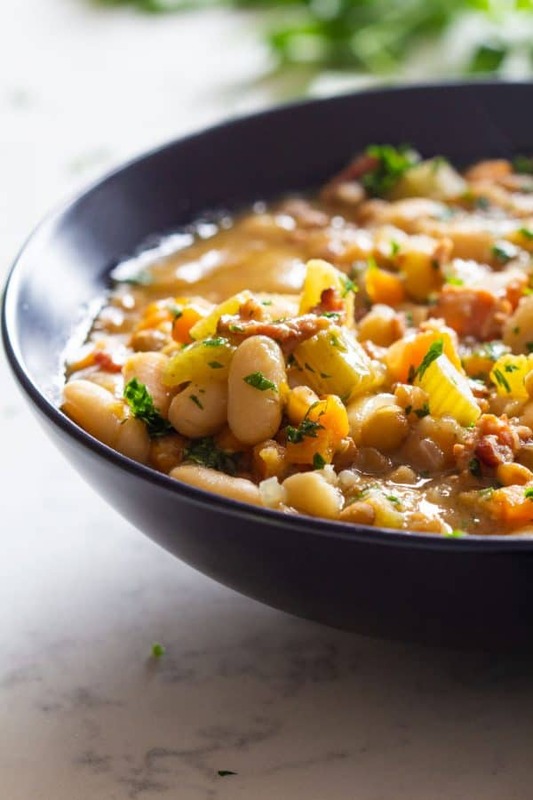 A hearty instant pot lentil soup with bacon and veggies. 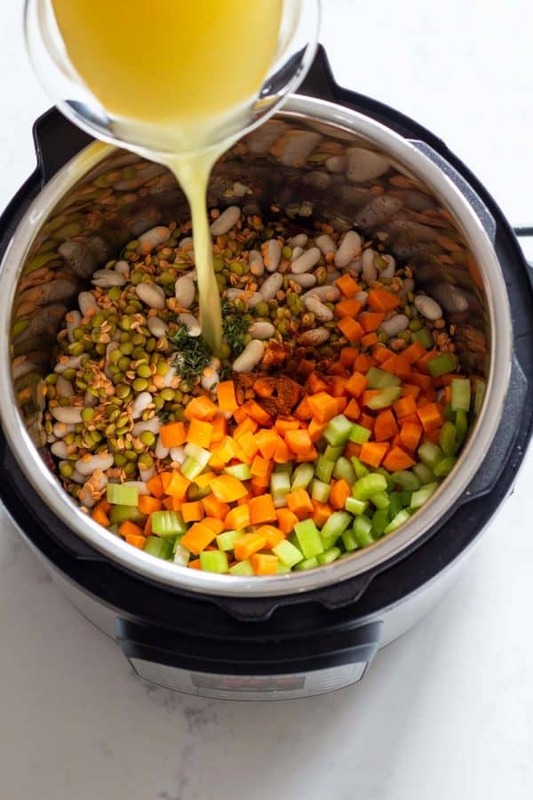 A pressure cooker lentil soup chock full of nutrition and tons of flavor. A must have in your recipe book! Soak legumes in abundant water for about 12 hours or overnight. Press "sauté" to preheat the instant pot. Once hot, add sliced bacon and stir-fry until it starts crisping up. Add chopped onion and crushed garlic to the bacon and sauté until soft. Drain and rinse legumes and then add to instant pot. Add diced vegetables, thyme and chili powder and then pour chicken broth over everything. Make sure all legumes are just covered in the broth. Beans that remain uncovered, won't cook through. Put on the lid, turn the valve to sealing position and set for 25 minutes on high pressure. Let pressure release naturally and then try the soup to see if it needs salt and pepper. This will depend on how seasoned the broth was. Sprinkle with chopped fresh parsley and enjoy! The soaking for 12 hours is NOT optional. It is a must for this recipe. Please do not rate my recipe and the texture of the soup if you did not soak the legumes. Hi, this sounds and looks amazing! I have searched all the stores in town and can only find green lentils. I’m hoping to make this for dinner tonight. Would it be terrible if I used 2 cups of green lentils? Thank you so much for your awesome recipes. Oh, it’ll be delicious with just green lentils, too. However, remember this recipe is for soaked lentils only. If you put them in unsoaked the consistency will be completely different. Can I double this recipe and use the same time in the instant pot for a larger amount? I went ahead and tried it, followed the directions and soaked the lentils. This came out so yummy!!!!! Thank you for the recipe! Yay!!! I’m so happy you liked the recipe. This soup is one of my favorites of all times. Yes!! You just have to watch the “max” line. Don’t go over that line but other than that you can absolutely make more. This soup freezes amazingly. Done that several times already. I followed the directions exactly except did not add any bacon (also did not add any oil for onions and garlic). This came out the perfect consistency and my husband really liked it. The only thing he wants me to add is a touch more spice to give it a little punch. We will be making this again and again. Thanks. The texture of the soup was a deal breaker. It was super mussy. We could not eat it. Mandi, I’m so sorry to hear you didn’t like it. Was the texture as shown in the video? If not, could I help you troubleshoot and find out what could have gone wrong? If it was like in the video, then obviously it’s a matter of preference of textures. I had the same problem others did. It tasted good but the texture spoiled it, being pasty. The soup was mush and I hadn’t even soaked the lentils. I am guessing that 25 minutes cooking under pressure is too long. I think I will try 15 minutes next time. Hi, I just made this for the first time, and the lentils absorbed ALL the liquid. I’m not left with a soup at all. Any thoughts? To clarify, I ended up with something that had the consistency of refried beans. In the video you can see the consistency of my soup and how it’s intended to be. Was it like that? No it was not like that at all. It was MUCH thicker and pastier. That said, in hindsight, it was the soaking I think. Will try again. I’m glad you’ll give the recipe another try. If you didn’t soak your lentils then they will absorb A LOT more liquid and it’ll become pasty instead of soupy. Hey Ross, did you soak your lentils for 12 hours minimum? If not then that was the problem. I bet that was it. I’ll have to try again. Thanks again. Hi Adele, I’m sorry. 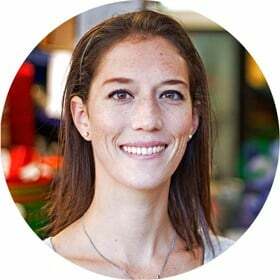 It’s just that I keep getting requests for more and more Instant Pot recipes because many of my readers have one and don’t know what to cook in them or how to cook their favorite meals in them. I take on the challenge and create and find out and research and test for them. 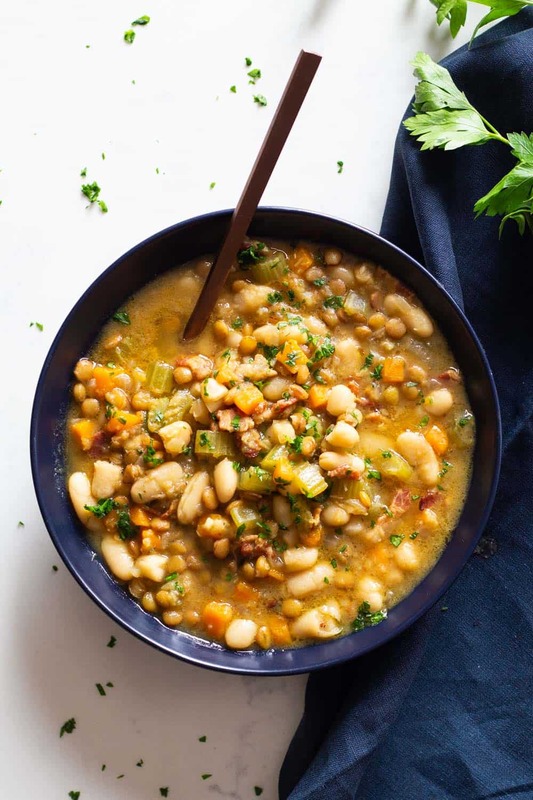 I haven’t tried this lentil soup in a regular pot, however, I’ve cooked both lentils and cannellini beans in a regular pot in 1 hour. I suggest you follow the instructions as stated for the Instant Pot version and add 2 more cups of broth to account for evaporation and then bring to a boil and once boiling reduce heat to low and simmer for 60 minutes. For the slow-cooker I suggest 4 hours on high or 8 on low. Looks delicious. What can I substitute for bacon, please? Simply use a little oil to fry the onions in. Looks really good! I only have the canned beans at home – is it okay to follow the recipe as is or should I add them at the end? The cannellini beans you mean? Yes, cook the lentils and all and then once the NPR is over, add then canned beans and bring the pot to pressure again for just 1 minute to heat them up. Then do a quick release and you’re good. I do not eat bacon but would love to make the lentil soup recipe. Would it still be tasty? Do I have to add a substitute? Yes!! It will still be absolutely delicious. Just use a little oil to fry the onions in and that’s it.